Are any worth a go? The last few months on the Nintendo Switch have been absolutely crazy. It feels like there are about 20 new releases including ports each week on Nintendo’s nearly 1 year old hybrid console. November in particular has been one of the busiest months on a Nintendo console ever for me. We rarely cover ports of games that have released on other platforms when the original release had a review. In some cases it makes sense doing new reviews for new or exclusive content but in many cases games just see direct ports with no new additions that don’t warrant a full review. The Switch ports on the other hand allow for a lot of experimentation when it comes to control schemes and allow for both home console and handheld play. Some games do great stuff with single Joy-Cons to allow for 2 player co-op right from the get go on the Switch and others take great advantage of the touch screen and physical controls. This feature will discuss some Switch ports that do interesting things and others that just are direct ports and whether they warrant a purchase once again. Slain: Back from Hell is an interesting indie game not just because of the content but how the release has been across platforms. Originally a Kickstarter project, Slain caught my attention thanks to the lovely retro styled visuals and the kickass heavy metal soundtrack. On release, it had a lot of issues and basically disappointed many. Wolf Brew Games actually took all the criticism and fixed a majority of problems with the original release to give out a free update that changed the game from Slain to Slain: Back from Hell. This was hard as nails but super fun on PC. I reviewed the PlayStation 4 and Vita versions of Slain last year. While an ideal world would let me play every indie game on a portable device, some instances don’t work out well. Slain had trouble on the Vita and is a sub par experience there in its current state. I jumped at the chance to check out Slain on the Switch because I was hoping for an experience like the great PS4 port. Unfortunately, the experience has been far from that. While I’m no stickler for 60fps, I do expect a constant frame rate. Slain on the Switch struggles even to maintain 30fps in many situations with the whole game coming to a crawl resulting in an experience that deserves some slow sludge metal and not a traditional fast heavy metal soundtrack. This is for both handheld and docked modes. Another problem is in the main menu. The text for New Game etc is lower resolution than the rest. The lack of HD Rumble or rumble in any form from what I could see is also disappointing. Golf Story has spoiled me and I wanted some form of rumble feedback here. 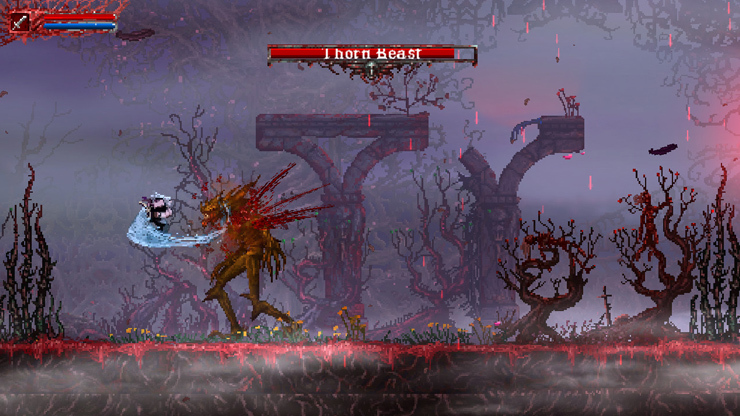 Slain: Back from Hell is not worth buying in its current state on the Switch. Get it on PS4 or PC if you have to because it just isn’t fun playing a game that slows down and can’t maintain a locked frame rate. If these issues are addressed in upcoming patches, it will be worth it. Update: The developers have informed us about an upcoming patch that adds support for higher frame rates and more. We will revisit this when the patch is live and put a final score. Over the last two years, Curve Digital has become one of my favourite indie publishers. I’ve tried my best to check out each of their releases and rarely been disappointed. In July this year, they published iFun4all’s Serial Cleaner. Gary played it on PS4 and you can read his review here. I played a bit of it on PC but it just felt like another game I should wait for a handheld version of. 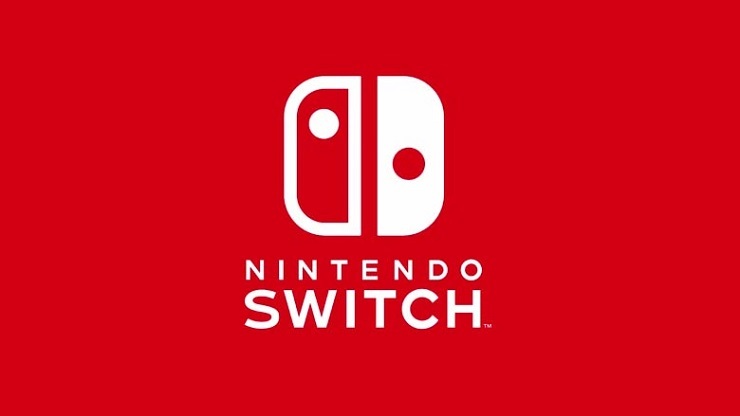 Fast forward to now and we have it on the Switch. 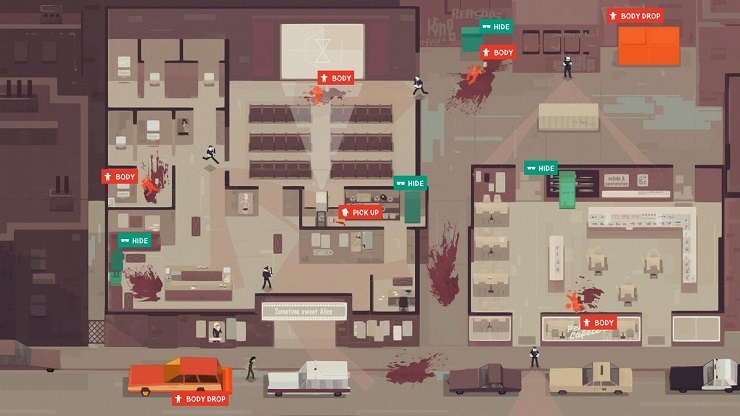 Serial Cleaner has you playing as a cleaner for a mob. Your aim is various things involving cleaning crime scenes and avoiding getting caught. Remember Hotline Miami? Imagine a more abstract version but you actually end up cleaning the scene and retrieving bodies and other evidence instead of actually causing a ton of violence. It plays like a stealth game and has some super art and music. The Switch port is fantastic. I had no trouble with it in my time both docked and handheld. The art looks excellent on the Switch screen and it controls brilliantly. The one issue I was hoping would be fixed here affects all versions. Some of the dialogue boxes and some other interface elements don’t stand out enough from the environment. This isn’t a big problem but it is an outlier in an otherwise great experience. One gameplay complaint I did have is things can feel a bit repetitive after some time. If you’ve held off on Serial Cleaner, this is a fantastic port. I’d absolutely recommend this over the other versions as well for the convenience of the hybrid console. Serial Cleaner is well worth it on the Switch. I enjoy playing physics based games quite a bit. The sandbox level ones are even better for me. Human Fall Flat is a lovely physics based game with a ton of freedom. You play as Bob who exists in an abstract world and is trying to get out. Controlling Bob is quite the task and it will take some time to get used to making him cooperate with you. Levels involve you having to push, pull, throw things, and more and there’s always a fun spectacle involved here. The best part is you can tackle the level at hand as you please. There are loads of tutorials or videos if you need some help but you can just experiment and have fun. The big problem I have with the actual game is the camera. It can get in the way sometimes. While this has been a blast to play solo, the coop mode is a lot of fun. It is unfortunate that you can’t use individual Joy-Cons to play this with 2 people and require full controllers. But the co-op is a lot of fun if you do have full controllers and the splitscreen performance is very good. 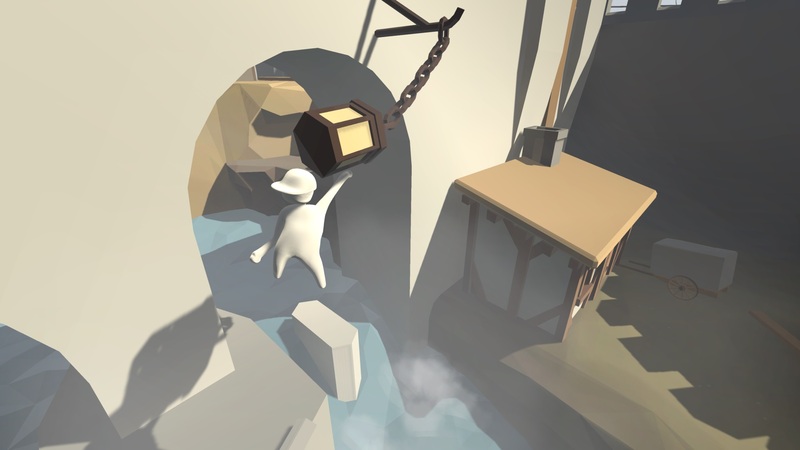 Human Fall Flat is a very good port. I would like individual Joy-Con support to be added in a patch but if you’ve been waiting to check this out and want to on the Switch, go for it. I got to know about Mantis Burn Racing properly when it was announced as a native 4K 60fps PS4 Pro title. 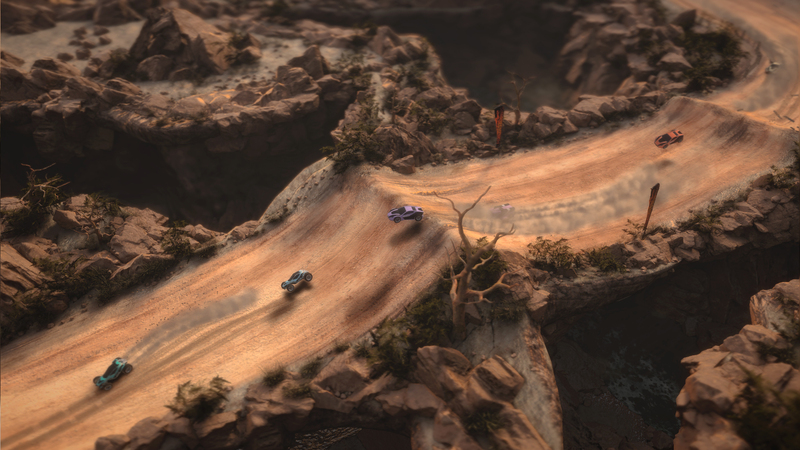 Mantis Burn Racing eventually made its way to multiple platforms. It reminds me of Rocket League in a lot of ways with how the interface is and how you get into races. There is a lot to do if you want to only play solo and unlock things but this really shines online. Speaking of online, as with Rocket League, Mantis Burn Racing has cross platform play. While this may not be a big deal to some, having cross platform online for indie games is a blessing. I know for sure that there will be people online right from the get go because this is a late port that has a player base on other platforms. You can toggle this on or off but I haven’t had trouble getting into a game at all since launch. The upgrade system is like an RPG-lite system and it has been fun to playthrough the varied locations once again. This top down racing game has a lot to like and it may sound cliched but face to face local split screen on the Switch with this has been a game changer. Games like this supporting face to face split screen is what I’ve wanted from a variety of games on iPad already but the lack of proper controllers and support on iOS has made it impossible to have anything but some basic games provide split screen there. You can play 1v1 with a single Joy-Con each and it works great. It supports traditional split screen as well on the TV and local wireless for up to 8 players together as well. When it comes to performance, there are a few instances of minor slowdown but nothing major like a lot of the other ports. I do wish it looked a bit better in portable mode. A bit more visual polish could really make this shine on the Switch screen. VooFoo Studios has done a great job with this port. One interesting thing about the Switch hardware and Nintendo being more lenient with games on the store is the jump some mobile games have made to the Switch. We saw this with VOEZ around launch and then even had DEEMO (link to my vita review) make it here. Both of these, as of this writing, are handheld only games. They will not work with a controller and are touch screen only. Both of those games are a single purchase and include almost all the DLC released released on other platforms from the get go but command a premium price compared to other platforms. The math works out in the end because you get more value for the content but what about direct ports? 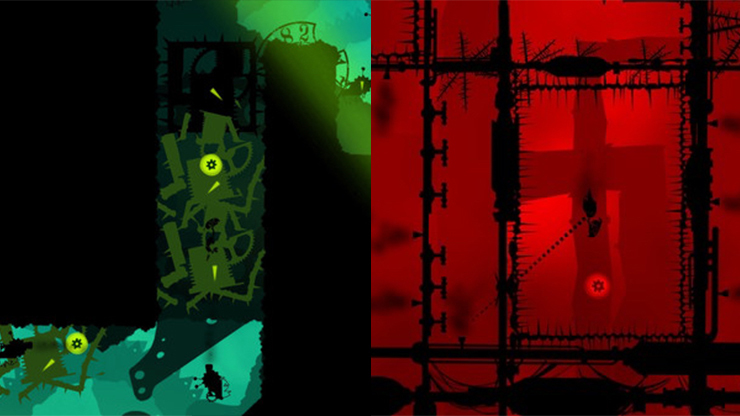 Green Game: Timeswapper and Red Game Without a Great Name from iFun4all are two mobile games that have been ported to the Switch and are handheld only. Both of these have a common premise which is getting a mechanical bird to the end of a level. The difference is Red Game has you controlling the bird directly while Green Game has you interacting with the environment objects while the bird is in autopilot. While I do understand why Red Game is touch screen only, Green Game could see button controls added given the mechanic basically switches between phases by touch and doesn’t rely on positional touch screen use or precision. Visually, they both remind me of a singular coloured version of Badland. Visually, there’s nothing to complain with the menus and the games. They look nice and run well. The big visual problem is in the homescreen icon. Instead of using some key art or creating something from scratch for the Switch, both games use the mobile icons complete with rounded corners. I think these two are among the worst icons on my Switch home screen. That’s basically my only complaint with the games. They play well and have some hard levels later on but serve as nice time wasters for a few minutes at a time. With 50 or more levels, there’s a lot of value for the super low asking price. Despite having some of the worst icons on the Switch, these two games are the cheapest paid games on the eShop. While I’d recommend picking them up on iOS or something, they serve their purpose well. I just hope they patch the icons soon.